Ideal for use when blowing beads , shards or boro work. Allows work and blowing without moving the blowpipe from flame to mouth repeatedly. 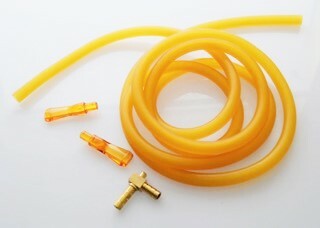 This set includes 6ft of very flexible hose , a brass 90 degree swivel and 2 mouth pieces.